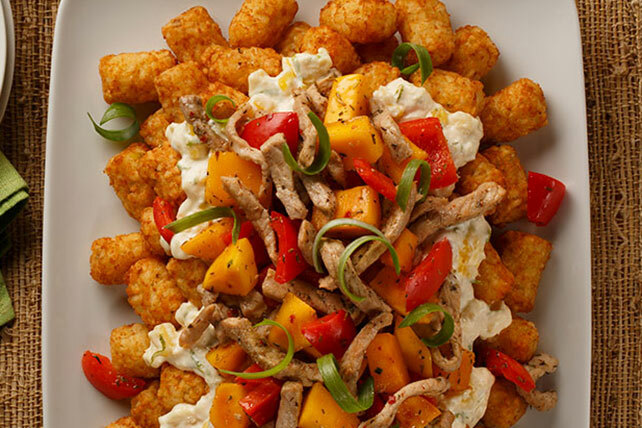 Add some island flavor to TATER TOTS with this Jamaican-Style Pork Totchos recipe. Pork totchos are sprinkled with jerk seasoning, mangoes & pineapples. Bake TATER TOTS as directed on package. Meanwhile, mix pineapple, mayo, lime zest and juice until blended; set aside. Toss meat and peppers with jerk seasoning in medium bowl; spoon into large skillet sprayed with cooking spray. Cook on medium heat 6 to 8 min. or until done, stirring occasionally. Add mangos; cook and stir 1 min. or until heated through. Spread TATER TOTS onto serving plate; top with pineapple mixture, then meat mixture.